'Ai ai ai, Miuuurrra,' I hear a voice behind me exclaim. By the time I turn around though, it's impossible to tell where it came from. This, for two reasons: first - the crowd is milling around very thick. Second - judging by the sheer emotion in that voice, it would not be unthinkable to assume that the speaker of those words had fainted dead away after catching sight of that most beautiful Lamborghini of them all. You see, we're in the heart of Bologna at a spot called the Piazza Maggiore that, even at its drabbest moment, cannot be described as anything other than beautiful. But then, transforming this space into something otherworldly is a fleet of 359 Lamborghinis from all over the world that have driven into the city as a part of the marque's 50th year celebrations. It's a gathering like no other and it makes you feel like you've stepped right into Ferruccio Lamborghini's subconscious. A place where 350GTs, Countachs and Diablos jostle for space with Espadas, Jalpas and Urracos. Where the results of the vision of men like Gianpaolo Dallara, Nuccio Bertone and Marcello Gandini is right there in the metal for all the world to see. It is essentially a large piece of automotive installation art - beautiful, overwhelming and surreal all at once. And all of this is with the engines switched off. I'd had the opportunity to witness and listen to this very art in motion the previous day as the Lamborghinis arrived in Bologna after their 388km drive from Rome, kicking up an automotive symphony like no other. The sound from the 6.5-litre engine of the Murcielagos combining with the race car-like roar of the Jota. Three hundred odd V12 engines growling, howling and kicking up a din... a sound that moves every single one of those reverential Italian fans gathered there. Some smile, others cheer loudly, and still more stand frozen in disbelief. Imagine then, how the people who are a part of the drive itself must feel. After all, they're the ones who have piloted these beautiful beasts through some of the finest driving roads Italy has to offer - going from Milan to Forte Dei Marmi then onwards to Rome before stopping overnight at Bologna. 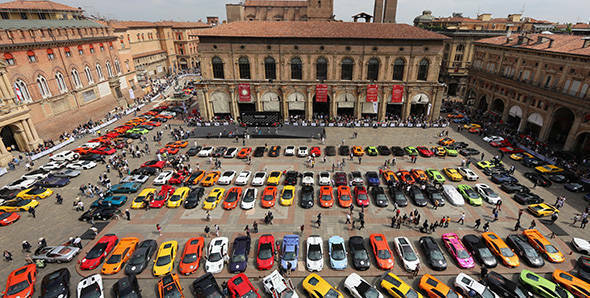 It's the drive of a lifetime, and the final leg will see them travel to Sant'Agata, the birthplace of these machines. 'Very smooth and very fast,' Peter Wolf of the Lamborghini Classic Club in Germany describes the journey. He's co-driven a sleek black Urraco owned by Joves Volkmann through the journey. Volkmann himself is animated and breaks out into something of a mime, first gesturing to all the buildings that surround us before pointing to the Lamborghinis that we're surrounded by and finally uttering one single word - 'Beautiful'. It's his explanation as to what lies behind the charm and appeal of Sant'Agata's finest. And while Volkmann might only drive his cars on Sundays, there are others who drive it at every single opportunity they get. 'I've clocked over 150,000km on this since I bought it,' grins Olivier Pinat pointing to his white Countach. Then, catching sight of my look of disbelief, he opens the door and pushes me right into the driver's seat, till I find myself staring past the steering wheel and at the odometer. I can assure you, having examined the evidence, that he's a thoroughly honest man. Amidst all the celebration of the tricolore, however, there is one lone trace of the tricolour. Gautam Singhania, automobile enthusiast, is the only Indian participant at the event. 'Passion for cars is all about emotion. And Lamborghini is all about dreams,' he declares. 'Pretty much every owner here, at some point when he was a child, said he wanted to own a Lamborghini. And probably when he made the money went and bought the one he dreamt of - it's fantastic,' he smiles. Indeed it is. But what of those people who dreamt of Lamborghinis but couldn't own them? Well, they find a way to be close. Like Daniele Turrini of the Polizia di Stato, who remembers seeing his first Lamborghini at the tender age of five. Turrini is a part of the motorcycle patrol that leads the convoy on this iconic drive and even though he isn't behind the wheel of a Lamborghini, he's simply happy to be a part of the event. 'I've dreamt of this for years,' he tells me with a voice brimming with emotion. And as the convoy of Lamborghinis leave the piazza and make their way back home to Sant'Agata, there's one image that stays with me. That of Turrini on his motorcycle leading the procession of Lamborghinis and riding off into the distance with a broad smile on his face. There's a lesson in here somewhere and it's very simple, too. We'll give you a hint - it's all about having dreams.